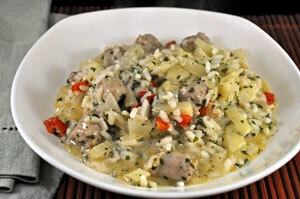 Sausage, Fennel and Pepper Risotto, Thyme for Cooking comfort food. I used chicken sausages for this - but use any flavor you like, turkey, pork, spicy or not. In medium saucepan heat butter over medium heat. Add onion and sauté until transparent. When wine is almost absorbed add a 1/3 cup of stock, stir. Before the last 1/3 cup taste a few kernels of rice. They should be just 'al dente' - slightly resistant to the tooth but fully cooked. If more stock is needed add it 1/6 cup at a time and waiting until almost completely absorbed. Stir in the Parmesan and condimenti, pour into a bowl or risotto platter and serve immediately. It will continue to absorb liquid and the leftovers (if any) will be very stiff. Cut the sausage into 1" (3cm) pieces. Chop the onion and pepper. Slice off stem end of fennel, remove outer layer if needed, otherwise rinse. Cut fennel into 1/4" (.5cm) slices, then cut slices in half. Heat olive oil in nonstick skillet over medium. Add pepper, fennel and onion and sauté 5 minutes. Add garlic, sausages and sauté until sausages are cooked through, 7 - 8 minutes longer. Turn heat to low and let cook slowly until needed.